On this day I'm missing you deeply and I'm remembering you with love and affection and a heart full of appreciation. When I was searching for meaning, for direction, and floundering on the brink of despair, you caught hold of me and turned my life around, by ringing the message of transcendence, opening up the path of bhakti. Today I'm feeling immense gratitude to you. I know you did this at tremendous personal sacrifice; and when I see how hard it is for me to make similar sacrifices this makes me appreciate you even more. I want to thank you for setting such a high and consistent example of personal integrity for me, for your consistent example of concentrated focus on your service and your steady example of a sober mind and caring heart without being mushy and sentimental. I will be striving all of my days to follow in your footsteps. Also, thank you for freeing my mind. By this I have learned to accept responsiblity for making my own judgements and decisions, applying the guidelines of KC to my best ability, and not relying on the various crutches that are strewn all over the path of devotional service, some of them seeming to be authentic parts of the process. 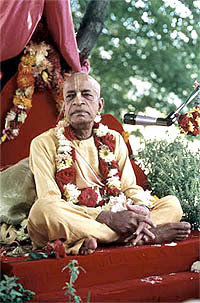 Srila Prabhupada, I cannot deny that I'm not always succesful in applying these guidelines, but I consider that I'm successful in that I have the courage to try; and I have the courage to accept both my failures and my successes. This I learned from your teachings and your example, and I'm grateful to you for that. It is a very tough lesson. It is so much easier to find reasons not to accept responsiblity, sometimes even in the name of surrender, or love, or harmony, or cooperation, or humility. By your kind grace I have learned to eschew all these rationalizations and do not depend on others to do for me what I need to do for myself. Thank you for teaching me this toughest of all lessons. Now, I strive to learn from both my failures and my successes, and bit by bit, I hope this development will empower me to center all my thoughts, words and deeds in a life of full service in the experience of the state you call Krishna consciousness. It is a gradual process, as you often said. Progress is slow, but I have become less passionate about quick results, and that is a kind of progess in itself. Yes, it is heartening, and I thank you for that.